Flying Dragon, photo by Harold Davis. View this image larger. We grabbed our four kids and brought them into the controlled environment of a studio. Actually, the environment became uncontrolled the moment we introduced our four kids (plus a friend of Nicky’s). Five kids in a studio space along with toys, costumes, swords, and a stroller for Katie to push is a recipe for chaos that is barely controlled—a primitive rendering of entropy not unlike that presented by the universe itself. The studio belonged to Graham Bird, who graciously and patiently presided over lighting our family version of chaos. Taking advantage of the studio lighting, I encouraged the kids to jump around and twirl. 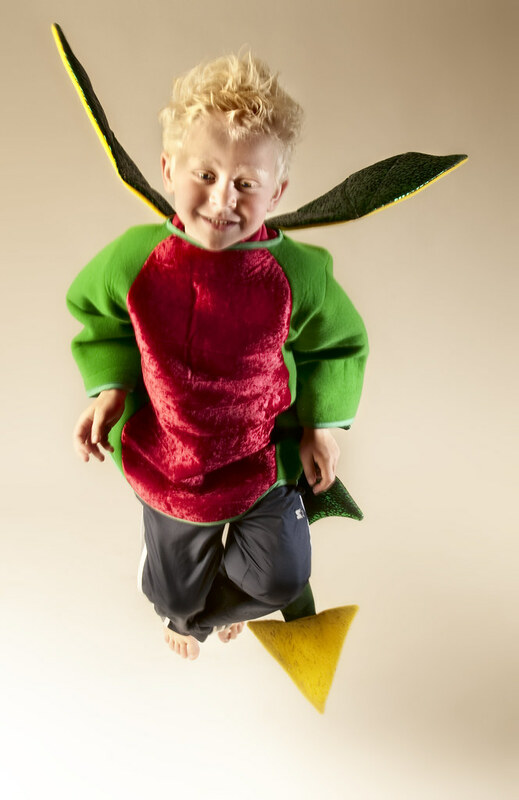 Mathew is shown here in his dragon costume coming down from a flying leap—caught in mid-air on a seamless background thanks to the magic of flash photography. San Francisco Moonrise, photo by Harold Davis. View this image larger. 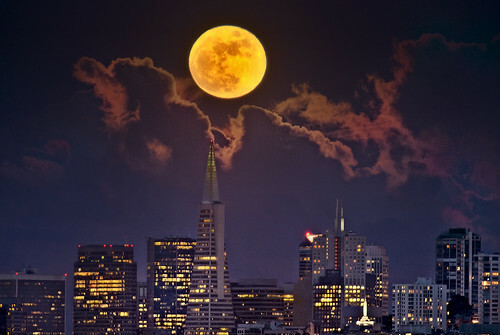 I learned from my friend Steven Christenson that the full moon would rise shortly after sunset, in theory lined up from Battery Yates on Fort Baker directly behind the Transamerica building in downtown San Francisco. Steven posted a note to the same effect with the Bay Area Night Photography Meetup group—and when I got to the site there was already small crowd of night photographers gathered, cameras and tripods ready. This was night photography as a kind of group sport, and the companionship was fun while we waited for the moon to rise and added layers to protect against the chill. The alignment of the moon seemed more or less as calculated, however the line of clouds kept it from appearing quite as low in the horizon as I would have liked. By the time it broke the clouds it was above rather than behind the Transamerica tower as you can see in the shot. I used a 400mm lens (600mm in 35mm terms on my D300). To keep camera shake down in the breeze—a serious issue with this long a lens—I hung my camera back on the center pole hook as a weight. I also boosted the ISO to 400, taking the trade-off of a bit more noise in exchange for a faster shutter speed to reduce softness from camera motion. I shot the moon at 1/30 of a second and the foreground at 1/2 of a second, and combined the two exposures in Photoshop. Exposure data: Nikon D300, 400mm, 2 combined exposures at 1/30 of a second and 1/2 of a second, each exposure at f/5.6 and ISO 400, tripod mounted. Orbit, photo by Harold Davis. View this image larger. Head down and hard at work on a new book project, it was fun this morning to take a break. 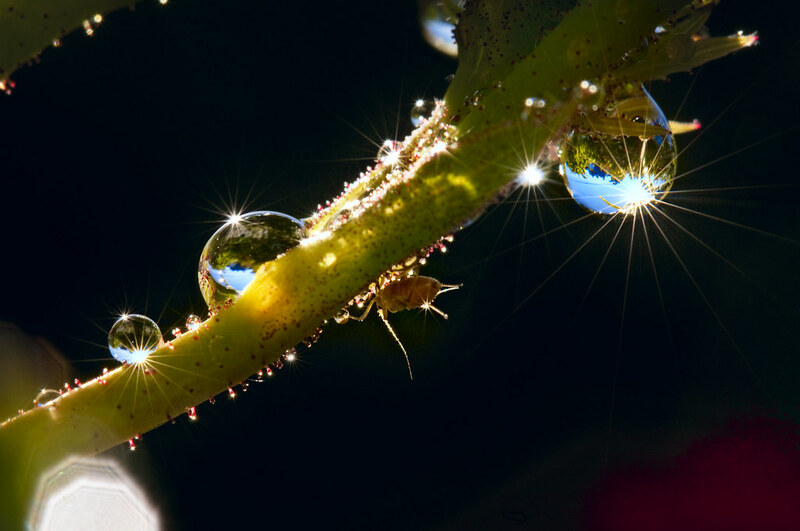 My break coincided with a break in the weather—so I got to photograph these beautiful water drops orbiting in the space around the flower that is their sun. 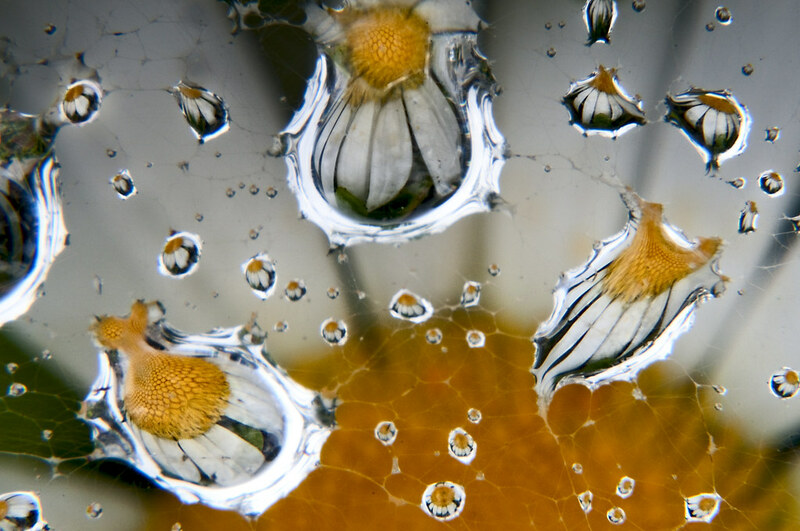 A couple of related stories with images of flowers reflected and refracting in inidividual water drops: Gaillardia Drop; Passion in a Drop. 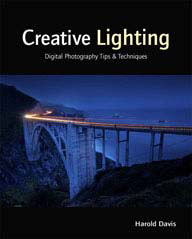 Briefly noted: My book Creative Black & White: Digital Photography Tips & Techniques is number one in the black and white photography book category on Amazon. Thanks to everyone who helped make this possible. Forest Awakening, photo by Harold Davis. View this image larger. The forest is a wonderful and magical place. Wandering along the dreary forest floor past fallen leaves, branches and spider webs suddenly the sun may beam through. You never know: those rays may hit a special rock in a sacred grove. Suddenly awake, the rock comes to life. The model is the flexible and fantastic Merrique, shown below in the child’s pose that is the basis for my Forest Awakening Photoshop composite. Model Bride 2, photo by Harold Davis. View this image larger. No Bridezilla, this bride posed in every way that we asked and was a model bride because she was, well, a model. Photographed at a wedding photography workshop led by the talented Michelle Pattee under the auspices of Martha Blanchfield’s Renegade Meetup Group—one of a number of unusual and effective photographic education events put on by this group. Shoot wide open, using low depth-of-field to maximize interest on the bride. Don’t worry too much about technical perfection and just get the shots; if you capture the spirit of the moment no one is going to worry about focus being off an inch or two. It’s not quite the pre-2008 halcyon days, but good wedding shooters in the Bay area can still make a bundle. Briefly noted: My image Objectify has stirred up some rather heated reactions. 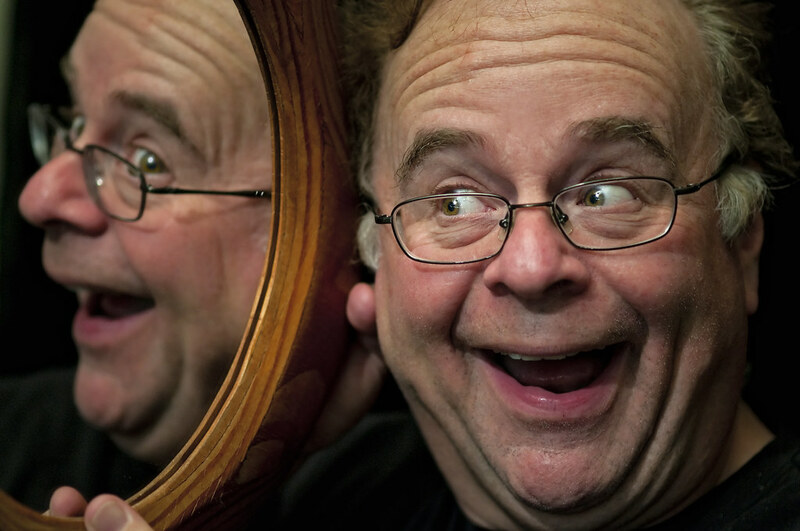 One comment on my blog begins “Are you going through a midlife crisis? The female form is so much more than a vase!” Indeed. Read the full comment and my response. It’s amusing once again to have to deny being in a midlife crisis. Objectify, photo by Harold Davis. View this image larger. This photocomposite combines a bouquet of flowers with the torso of a model in the vase. 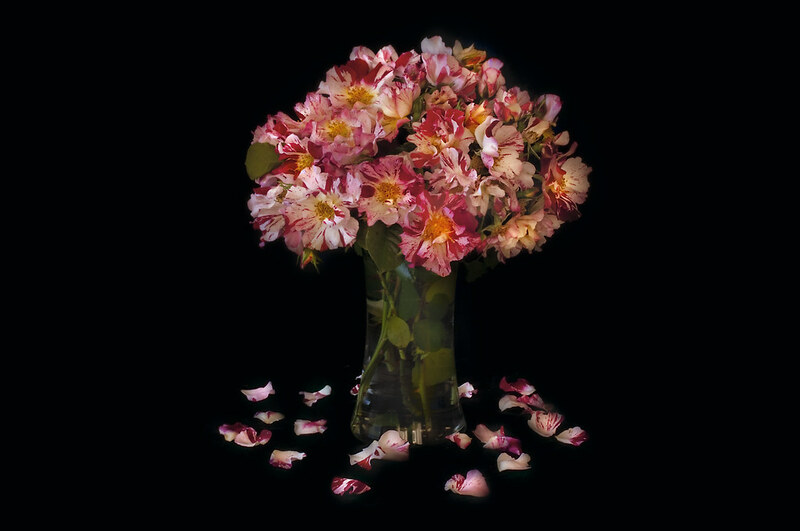 The model’s eyes are seen as flower petals beneath the flower arrangement. 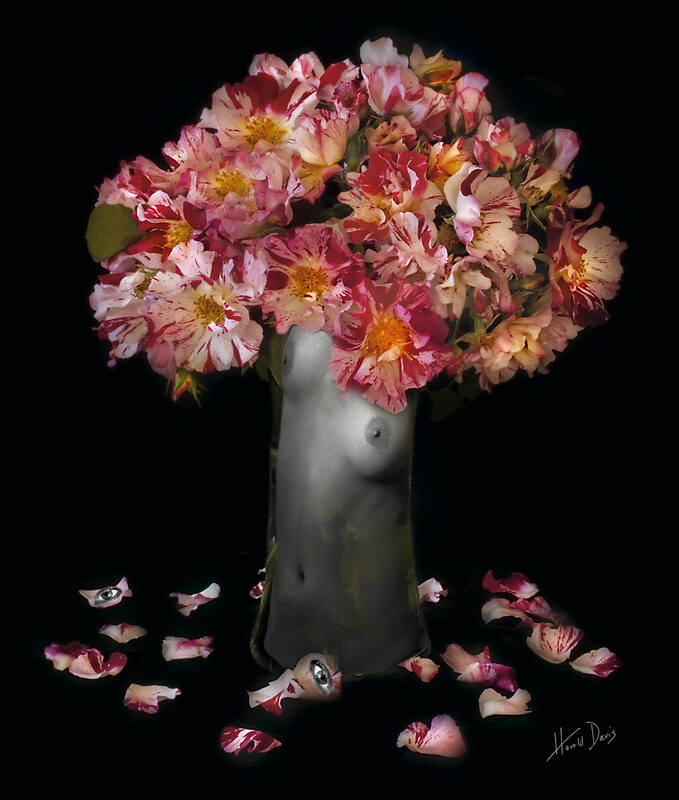 I used Photoshop’s Liquefy filter to bend the torso so it fit in the vase. My intention was to create a surreal but superficially plausible image, different in subject but similar in spirit to my Winter’s Bride. Kellie 3, photo by Harold Davis. View this image larger. As promised, here’s another view of Kellie—both in color (below) and after my monochromatic conversion (above). Some other stories with photos of Kellie: Portrait of Kellie; Making Herself Small; Kellie. Fourth of July Roses, photo by Harold Davis. View this image larger. 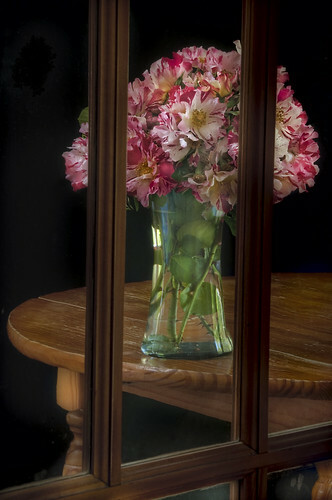 This is the bouquet of Fourth of July roses that I’ve previously shown shot through the panes of a glass door. In this image, I placed the flowers on a black background and combined several exposures for extended dynamic range using Hand HDR. Stay tuned. I’ve found another use for this shot—which I’ll show to you after I’ve blogged the other parts. 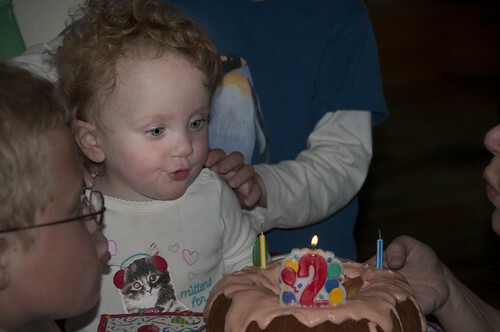 Katie Blows the Candles Out, photo by Harold Davis. 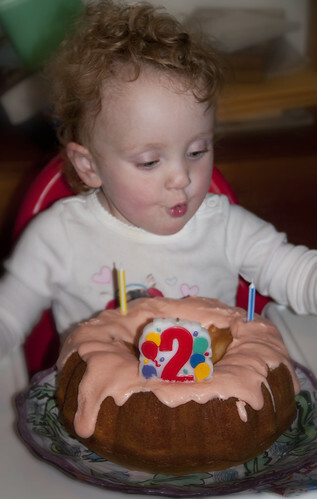 We celebrated Katie Rose’s second birthday yesterday. Katie was excited all day, completely got the concept of presents and birthday cake, and enjoyed blowing her candles out. Her brothers had a grand time at Katie’s birthday party. Also present: Grandma Barbara and her other grandparents, my parents, Martin and Virginia. The only problem involved two tired parents getting four wired kids to bed. It’s so exciting to see Katie Rose doing so well. She has come such a long way from her birth. The intervening two years seem like forever and no time at all. We are so very lucky to have a normal, happy, active two-year old girl. We love Katie Rose very, very much. Portrait of Kellie – Monochrome, photo by Harold Davis. View this image larger. I will not provide Kellie’s contact information, and I will not pass any messages along to her. Please, she is a shy and private person. But, for those of you who’ve asked, here is more Kellie: a portrait in monochrome and full living color. Maybe more to your taste: some more Kellie figure studies are coming as well. Rule of Thirds, photo by Harold Davis. I photographed this bouquet of Fourth of July roses through the divided lights of a glass door, using natural light and a black backdrop. Exposure data: 112mm, 3 seconds and f/36 at ISO 100, tripod mounted. Gaillardia Drop, photo by Harold Davis. View this image larger. The day was moist with sudden rain squalls followed by brief, intermittent periods of sunshine. In one of the times without rain I went out into the strangely moist world of my garden. 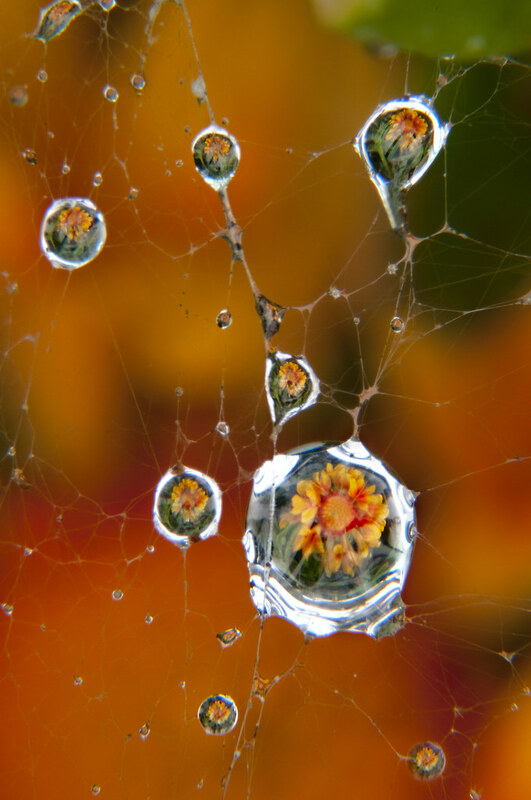 Staring down at the spider web strategically located above a Gaillardia bud, I saw the blossom perfactly framed in water drop. I ran inside to get my tripod and macro lens. Kit in hand, I framed the photo, locked my mirror up, and snapped the shot. Next thing, it was raining again and I retreated inside before the incoming Pacific squall. Related story: Passion in a Drop. Winter’s Bride, photo by Harold Davis. View this image larger. This is a Photoshop composite of a studio figure study combined with a number of shots of Yosemite in winter. I’ve written that at times I’ve felt like I was channeling Edward Weston. This time it’s more like I’m channeling Jerry Uelsmann. 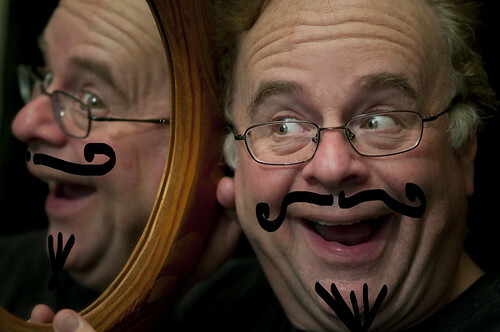 Self Portrait with Moustache, photo by Harold Davis. View this image larger. Here I am, Harold Davis, having fun with a mirror, and playing by myself! Self portraits are an interesting exercise. They are not the easiest kind of photograph to make from a practical viewpoint—and playing both subject and photographer at the same time gives one insight into the dynamics when these are two people rather than a singleton. As long as I’m prepared to make fun of myself, why not really do it up? I drew the Dali-esque moustache with the Photoshop Pencil Tool set to a calligraphic tip.